Finch irruptions are not that uncommon. They generally occur in some numbers, in some locations almost every year. But in some years the movements are larger and more widespread. The winter of 2012-2013 is shaping up to be one of those years. Irruptions are not necessarily caused by inclement weather. It appears to be more associated with a lack of available food. Ron Pittaway has spent years studying irruptions and has become the guru of winter finch forecasts for southern Canada and the northeastern United States. Pittaway is predicting a pretty good year for finch movements to the south this year. Some of the species he notes are red and white-winged crossbills, redpolls, pine grosbeaks, evening grosbeaks and purple finches. Forecasts are forecasts, kinda like presidential polls – maybe not that bad – more like weather forecasts. The last big winter finch irruption forecast was for the winter of 2007-2008 and that didn’t produce many out of the ordinary sightings here in WNC. But as I look out at my feeders today and over the past weekend I get a little tinge of anticipation. I first noted a female purple finch at my feeder last Friday (Oct. 26.) Saturday there were larger numbers and by Sunday I was hosting at least 15 to 20 purple finches. And this morning (Oct. 29,) I looked out to see a finch triple play. On one feeder, I had purple finch, American goldfinch and pine siskin, diving voraciously into black oil sunflower seeds. I guess I’m gonna have to go get some thistle seed and hang the finch feeder. The siskins and goldfinches will likely gravitate to it and won’t have to bump wings with the larger purple finches – although siskins take up for themselves pretty well. But what I’ve got my fingers crossed for are evening grosbeaks. 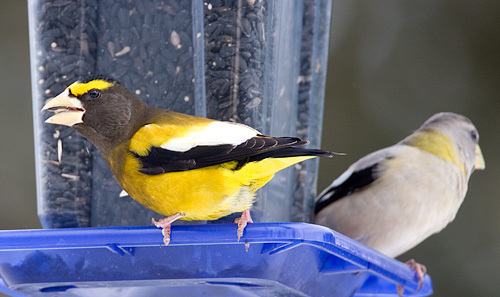 These large gold, black and white finches are a sight to behold – an avian Darth Vader in a super dark and gold helmet. Beautiful to look at, evening grosbeaks can be scary to feed. They like to congregate in large numbers where food is available and if you make food available you can expect a sharp up tick in your winter bird food bill. The last time I had them at my feeders was in 1999 or 2000. I began just piling sunflower seed along the deck railing and it was common to see 30 – 40 of these beautiful finches lined up for the buffet. It would be nice to see them again.